A word of warning to anybody who is looking for a Las Vegas package deal with Virgin Holidays – don’t get excited too soon when you drop on a bargain deal online. In fact, to be safe you should probably wait until you step onto the plane before you start counting down the days. T minus, err, zero. I found out just what a gamble they can be by trying to book a holiday for my sister. She’d already booked the week off work and found a deal on Expedia for about £500 each, then called me to ask if it was a good deal or if could I do better. £546 would be a phenomenal price for just the flights, never mind with a week’s accomodation into the bargain too. At this price it was either an insane promotion or it was priced wrong. Either way, I was going to try to take advantage of it. Laura found out that it was a mistake the same evening when she got a phone call telling her that the price on the web site was actually for just the accomodation and would she like to add on the flights now for another £500+ each. The answer was obviously "no". But the chances of them honouring the published price are, as you might expect, zero. Option one was to cough up for an overpriced flight. Option two was to forget it ever happened. OK, so I knew all along that something had probably gone wrong and that they might try to get out of this booking, but it did reveal a frightening feature of the Virgin Holidays online booking system. Once you fill in all the information on their web site, including payment details, you still have to wait up to fourteen days for written confirmation of the booking. Until it arrives, you just don’t know for sure whether or not you have a holiday. They can still cancel it at any time. Even if they charge your credit card, even if they book you a seat on the damn plane, they can still change their mind. While I would expect that in most cases they’re probably not interested in simply cancelling your booking just because they can, what’s to say they wouldn’t pull the plug on your package deal if your plane suddenly became very popular and they could make more money selling it as flight only (which, as far as I can tell, is a confirmed booking the minute you press submit). A delay of up to two weeks for confirmation of a flight booked online is just not good enough. In the end Laura rebooked with MyTravel for £294 each and snubbed the rock-bottom rate I found her for Imperial Palace in favour of the Excalibur for just a little more. Not a bad decision. 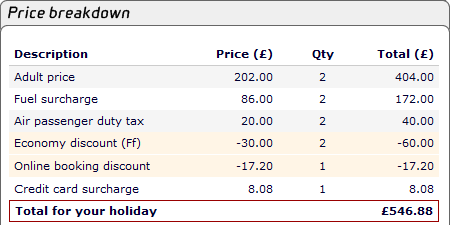 Overall, it was still about £200 cheaper than Expedia. Mission accomplished!